Okay, I know that everyone has already heard that blueberries are a super food. But do you know why? And, more importantly, are you regularly consuming them? In this week's nutrition habit of the 52 Weeks to Better Nutrition and New You series, it is time to look at just why these tasty little blue balls of goodness are so important for your health and get you eating more of them! Anthocyanins (found in blueberries) help protect against ageing and light-induced damage to the retina. Polyphenolic compounds (which are found in blueberries) may help to lower oxidative stress, reduce inflammation, alter the signaling involved in neuronal communication and protect against age-related deficits in cognitive and motor function. Blended dietary plants (including blueberries) have potential benefits to reducing inflammation and improving neurological health. Berry fruit supplementation may help protect against age-related deficits in cognitive and motor function. Blueberries may improve memory in older adults. A greater intake of high-antioxidant foods (including berries), may increase "health span" and enhance cognitive and motor function in aging. Adding fruits such as blueberries may provide therapeutic protection against age-related deficits and neurodegenerative diseases. Antioxidants (such as ellagic acid found in blueberries) may suppress oxidised low-density lipoprotein (the bad cholesterol) and help prevent atherosclerosis. Anthocyanins and some flavone and flavan-3-ol (found in blueberries) compounds have vasodilatory properties and may help reduce hypertension. Daily blueberry consumption for 6 weeks increases atural killer cell counts, reduces oxidative stress and increases anti-inflammatory cytokines. Pterostilbene (a compound found in blueberries) may inhibit the growth of pancreatic cancer in vitro. Berry extracts may inhibit growth of cervical and colon cancer cells. Berries such as blueberries may inhibit growth and stimulate cell death of human cancer cells. 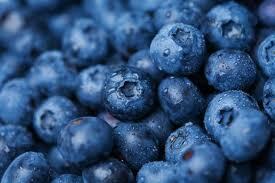 Blueberry proanthocyanidins may effect androgen-dependant growth of prostate cancer cells. Combine blueberries with other fruits to make a fruit salad. My personal favorite is: bananas, oranges, blueberries and strawberries. If you eat oatmeal, try adding blueberries to your oatmeal just after you pour it into your bowl. Frozen are great here as they help cool the oatmeal off faster so you can eat and go in the morning. Add fresh or frozen blueberries to your Power Shakes. Note: in highlighting the benefits of blueberries, I am not trying to say that other berries are bad or inferior. It is always best to eat a variety of berries - and a variety of foods in general. Basu A, Rhone M, Lyons TJ. Berries: emerging impact on cardiovascular health. Nutrition Reviews. 2010 Mar;68(3):168-77. doi: 10.1111/j.1753-4887.2010.00273.x. Boyer JZ, Jandova J, Janda J, Vleugels FR, Elliott DA, Sligh JE. Resveratrol-sensitized UVA induced apoptosis in human keratinocytes through mitochondrial oxidative stress and pore opening. Journal of Photochemistry and Photobiology. B, Biology. 2012 Aug 1;113:42-50. doi: 10.1016/j.jphotobiol.2012.04.013. Epub 2012 May 18. Cassidy A, et al. Habitual intake of flavonoid subclasses and incident hypertension in adults. American Journal of Clinical Nutrition. 2011 Feb;93(2):338-47. doi: 10.3945/ajcn.110.006783. Epub 2010 Nov 24. Chang WC, Yu YM, Chiang SY, Tseng CY. Ellagic acid suppresses oxidised low-density lipoprotein-induced aortic smooth muscle cell proliferation: studies on the activation of extracellular signal-regulated kinase 1/2 and proliferating cell nuclear antigen expression. The British Journal of Nutrition. 2008 Apr;99(4):709-14. doi: 10.1017/S0007114507831734. Epub 2008 Jan 10. Devore EE, Kang JH, Breteler MM, Grodstein F. Dietary intakes of berries and flavonoids in relation to cognitive decline. Annals of Neurology. 2012 Jul;72(1):135-43. doi: 10.1002/ana.23594. Epub 2012 Apr 26. Krikorian R, et al. Blueberry supplementation improves memory in older adults. Journal of Agricultural and Food Chemistry. 2010 Apr 14;58(7):3996-4000. doi: 10.1021/jf9029332. Heim KC, Angers P, Léonhart S, Ritz BW. Anti-inflammatory and neuroactive properties of selected fruit extracts. Journal of Medicinal Food. 2012 Sep;15(9):851-4. doi: 10.1089/jmf.2011.0265. Epub 2012 Aug 7. Joseph JA, Shukitt-Hale B, Willis LM. Grape juice, berries, and walnuts affect brain aging and behavior. The Journal of Nutrition. 2009 Sep;139(9):1813S-7S. doi: 10.3945/jn.109.108266. Epub 2009 Jul 29. Lau FC, Shukitt-Hale B, Joseph JA. Nutritional intervention in brain aging: reducing the effects of inflammation and oxidative stress. Sub-cellular biochemistry. 2007;42:299-318. Liu Y, et al. Blueberry anthocyanins: protection against ageing and light-induced damage in retinal pigment epithelial cells. The British Journal of Nutrition. 2012 Jul 14;108(1):16-27. doi: 10.1017/S000711451100523X. Epub 2011 Oct 12. Shukitt-Hale B. Blueberries and neuronal aging. Gerontology. 2012;58(6):518-23. doi: 10.1159/000341101. Epub 2012 Aug 16. Mannal PW, Alosi JA, Schneider JG, McDonald DE, McFadden DW. Pterostilbene inhibits pancreatic cancer in vitro. Journal of Gastrointestinal Surgery. 2010 May;14(5):873-9. doi: 10.1007/s11605-010-1164-4. Epub 2010 Feb 6. McAnulty LS, et al. Effect of blueberry ingestion on natural killer cell counts, oxidative stress, and inflammation prior to and after 2.5 h of running. Applied Physiology, Nutrition, and Metabolism. 2011 Dec;36(6):976-84. doi: 10.1139/h11-120. Epub 2011 Nov 23. McDougall GJ, Ross HA, Ikeji M, Stewart D. Berry extracts exert different antiproliferative effects against cervical and colon cancer cells grown in vitro. Journal of Agricultural and Food Chemistry. 2008 May 14;56(9):3016-23. doi: 10.1021/jf073469n. Epub 2008 Apr 16. Seeram NP, Adams LS, Zhang Y, Lee R, Sand D, Scheuller HS, Heber D. Blackberry, black raspberry, blueberry, cranberry, red raspberry, and strawberry extracts inhibit growth and stimulate apoptosis of human cancer cells in vitro. Journal of Agricultural and Food Chemistry. 2006 Dec 13;54(25):9329-39. Schmidt BM, Erdman JW Jr, Lila MA. Differential effects of blueberry proanthocyanidins on androgen sensitive and insensitive human prostate cancer cell lines. Cancer Letters. 2006 Jan 18;231(2):240-6. Shukitt-Hale B, Lau FC, Joseph JA. Berry fruit supplementation and the aging brain. Journal of Agricultural and Food Chemistry. 2008 Feb 13;56(3):636-41. doi: 10.1021/jf072505f. Epub 2008 Jan 23. Wedick NM, et al. Dietary flavonoid intakes and risk of type 2 diabetes in US men and women. American Journal of Clinical Nutrition. 2012 Apr;95(4):925-33. doi: 10.3945/ajcn.111.028894. Epub 2012 Feb 22.